""" keywords'/> "" " Do You Need Artist Card? Authentic and Bogus | Check Here | Best Actor Academy-The Monster Of Free Acting Tips ""
One of the Artist card issued. Is this good or bad? Are You Among Thousands Of Struggling Fools To Get An Artist Card To Fulfill Your Dream To Be An actor? Oh, so you want to be a Kamgar (Majdoor), A Laborer, or a Junior Artist or a Petty Worker in the cine industry on a fixed daily wage and want a union to protect you? Or you want to take this route to be a Bollywood actor and are willing to wait for 10 to 20 years? Good! Go ahead and take an artist card! But Do an Actor Really Need An Artist Card? Artist Card issued by supposedly only authentic 'CINTTA' is primarily for offering a protection to an artist's interest like payments, working hours etc. They usually cannot guarantee any role or any kind of job. Or perhaps when a production house requires a large number of junior artists for a crowd scene, CINTAA or Chitapat Artists associations like that of 'Shin Sena' may supply them. Artist card may be useful for junior artists, who is not professionally trained to play big and have NO ambitions to become a "Star" in the future. Either they have no speaking lines or may be one or two, only. They may or may not be well educated and are usually from a community of actors which require just a "job" and a "living" rather than to be a successful "actor" and a "Star"
The casting directors may not consider you for a role if you are a registered junior artist with an artist card due to an apprehension of your refusing to work overtime or in case of any dispute of payments or other issues, may go to the union for Redressal of your complaints, and may create problem during a shoot. An educated aspiring actor, who is professionally trained, without union affiliation or with an artist card, therefore, may stand a better chance and may get a better role compared to a union artist card holder. However, this is NOT a rule. There are examples of junior artists who climbed the ladder of success and have become a good actor. The best is to decide what are your priorities and then act. Though I have selected few with the best of my knowledge out of hundreds, you are advised to check the credentials, before you pay. Especially, DON'T PAY anything if after applying online with the portfolio you get a mail confirming your selection without your audition and then if they ask you to pay Rs. 3000 or more. They may be fraudsters and cheats. Copy of any one out of PAN CARD, RATION CARD, PASS PORT, DRIVING LICENCE, RESIDENTIAL PROOF, VOTER I CARD etc. One of the main artists’ and actors' unions in India is the Federation of Western India Cine Employees. The FWICE is a film industry worker’s union based in Mumbai, India. * However, their requirements for an artist registration are a bit tough, like experience in films and serials. Call them to find out the details or visit their website. 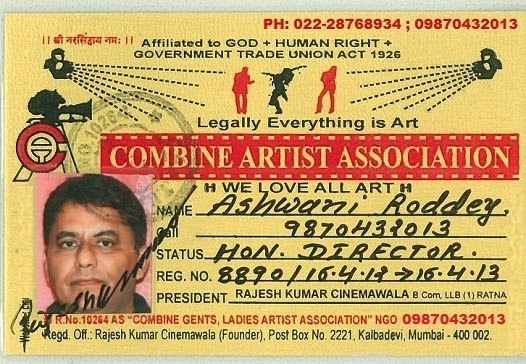 I would recommend and prefer artist card issued by Strong Political Unions in Mumbai, which in my opinion, cannot be refused by any casting director/ production house, due to backlash by that union. Opened in 2014. The office is in Dadar (East) near Ranjeet Studio. Check with BJP Office, the address of Chitrapat Union. IFAA Delhi is known in the film and entertainment industry. They claim, the association is not interested in the larger profile, but in the best profile. The association profile is purely its member's profile and every member is directly or indirectly connected to its activities. IFAA is a leading voice for Indian culture. IFAA is a tireless advocate for Indian culture and the development of India’s audio visual industries. Our union and members lobby for regulation and government policies that protect our culture and encourage audio visual production in all genres, expanding work opportunities for Indian performers. Be Aware of Bogus Artist Cards! Sir I was offered a role in one tv serial by a person whose ad I saw on quicker. I sent my pics and vids via whatsapp and He said that now u send me your address proof and artist card. I sent him my combined artist association artist card but he said that the card is not valid as i have got a character role and I have to make a fcf card the cost of which is 3000 rs. Please tell me what should I do. I posted a query on http://bestactoracademy.blogspot.in/2014/08/how-aspiring-actors-can-find-greedy-and.html yesterday night as anonymous. You asked me to send the copy of my artist card. I have attached the pics of my artist card. I transferred the money(rs 1,600) to the account of Bharat. S. Sadhwani on 2nd June 2015. I got the pics of the artist card that day itself on whatsapp but I have not received it via post although he is saying that he has sent the post. Please check whether the artist card is authentic or not. Thank you sir, this is very useful article. Your query is not clear. What's the difference "All of them union"? Firstly Mr Kiran pande, please learn some ethics on how to answer someones question, yes of course there may be labor people who supplies tea even though they are educated, because cinema is their fantasy and life, they take each and every opportunity they get, so please don't talk like a illiterate, answer in a dignified manner if the answer is already there in ur previous post, just copy the content and paste it in the comment instead of giving waste answers. I deeply regret if any of my answers look unethical. Many a times due to paucity of time, I either ask to read my blog which has more than 200 posts or read some previous post. My objective is to help people through my long experience and I do this being awake till 2 in the morning, without expecting any return. I hope you are young and I thank you for correcting an old man of 75 who like any other may slip in ethics. I will spend more time, out of my balance years to reply in details and answer relevantly to questions. Wishing you a Grand Success in life. Thank you for posting deatils.. Is really helpful..
Well i am trying to my luck in film and television industry.. So i have just few Question .. If i took Artict card and start of my carrier phase if i get small roles in industry, then after some years no one offer me big role? Bcoz i just took Artist card? If yes then what will be i do to get big roles ? An artist card may not help you to get big roles as nobody good will ask you for an artist card for a big role in a big production house. Today... i waste my 8000 rs bcozz my fb friend say me give me 8000 n i send you your artist card and we provide 100 % role but i have never meet this guy befor but i trust n now i totally sad ..
How to get start initially? MYSELF POOJA, I GOT A CALL FROM BALAJI ACTING CAREER, THEY FIRST ASKED MY INTEREST THEN MY SEND ME A WHTSAPP NO. TO SEND MY 8 PHOTOS. THEN AFTER 2 DAY I GOT CALL FROM SOME OTHER NO SAME GUY. HE SAID I GOT SELECTED FOR A SERIAL"EK DUJE KE LIYE" FOR SUPPORTING ROLE.THEN HE SAID THE SCHEDULE AND HOW MUCH PAY ILL GET AFTER AUDITION THEN HE SAID I HAVE TO MAKE ARTIST CARD FOR ENTERING FILM CITY WHERE I HAVE TO PAY SOME MONEY. SO KINDLY TELL ME IS THIS FAKE OR NOT. A fake and a fraud. No good production house will ask from an actor, an artist card. Same thing happened to me just now! Basically I am mechanical engineer so I have accounts on recruitment sites maybe they got my number from those sites. I shared my pics as interest in modeling I got recall after couple of days they claimed you have shooting in Jan & u will be salaried 1.2lakh for 10 days lol! That was same Balaji acting career institute! That lady enlisted me to fill form online with them so that I won't make any mistakes & pay 3500₹ online. I got hint of some fraud/fake call so came online to Google about this thing & came across this post. Thanks a lot to save my time & money. Sir .m from west Bengal. And I have to become an actor .. M trying to go Mumbai for Junie artist job.. Sir what is required for being junie artiest..
Hello sir this is Vinayak here , there is a guy whose name is John he said he is casting director for corsan film Belgium in India and on the basis of my directed shortfilms he said I've been selected directly foe the shoot or the lovers remix 3d which is going to be directed by Roland joffe next year in Madhya Pradesh for one month and 1week shoot in Queensland Australia and they will pay me 17000RS per day AND without any audition he said I got this role for supporting main character lead role he asked me to him PAN CARD , PASSPORT ,ADHAR CARD VOTER ID AND INTERNATIONAL ARTIST CARD so suggest me what should I do I hope to hear u soon..
JuniorArtists 🔅Dancer,🔅Assistant Director ,🔅Spot Boy,🔅Assistant Camera Man ,🔅Helper Boy. Should I go for card? What should I do? Please give me direction. I saw an ad on quickr regarding the casting in tv serials on star plus channel. I messaged that guy and he asked me to send a few photographs to him on whatsapp. After seeing the pictures he has asked me to come to a certain adress on next saturday along with a 500 registration fee and an id proof copy. Is this fake?